With the news today about the death of Billy Graham, I wanted to share this quote from him. I have no idea how many people were drawn to God, or back to Him, through the faithful service of Billy Graham, but upon His arrival in Heaven I'm sure he heard God say, "Well done, good and faithful servant!" As they reported on this in the news, the reporters said Billy Graham served with integrity - he said he wanted to serve God with faithfulness and integrity. It looks like he did! When my day comes to enter Heaven, I want to hear those words! I want to serve faithfully and with integrity. I want to live the days I have remaining in a way which points others - especially my grandsons - to God. 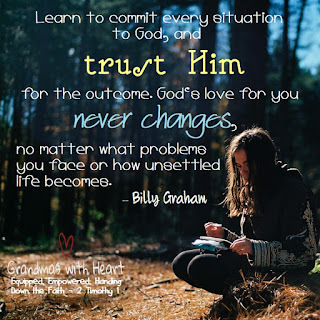 I love this quote - no matter what, trust God for the outcome because His love never changes! I want my grandsons and family and friends and all with whom I come in contact to know this is true! I want them to know they can, and choose to trust, God no matter what.